Beginning in 2016 WARA, in co-operation with HamWAN in Washington state, began establishing a high speed digital data network for amateur radio use in greater Victoria. Aside from out of band Internet access, this network provides ‘off net’ data services to users and EOCs in the event of a major communications outage. Note that the vast majority of these ‘off net’ services will continue to function regardless of Internet connectivity – the network can function as a complete stand-alone system or as part of the larger Internet. We currently receive our Internet uplink via a point-point link with a HamWAN site just north of Seattle, Washington. Current speeds range from 3 to 10 Mb/s depending on the quality of the link (generally weather dependent). WARA is currently working on setting up a second Internet feed to the system for redundancy. 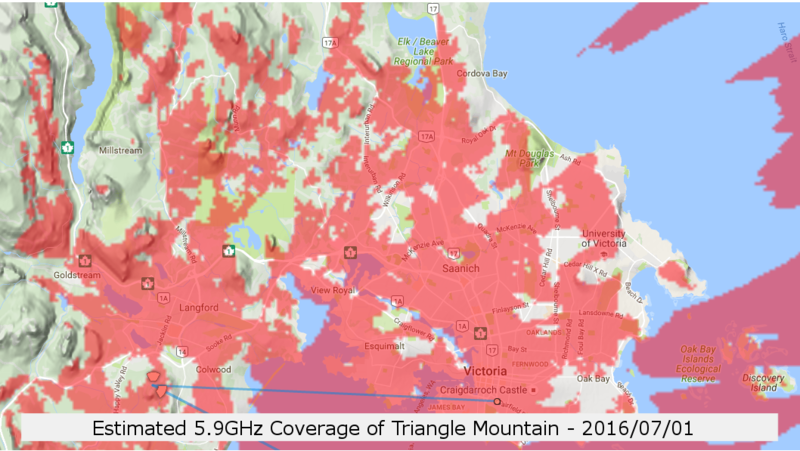 Our ‘off net’ services are all hosted out of a datacenter in Saanich which links back to Triangle Mountain via 5.8 GHz wireless. No Encryption – Encryption is not permitted on any amateur radio frequency or mode and high speed data networks are no exception. While we are not currently filtering encrypted traffic, we ask that users of the system exercise self-regulation and not send encrypted data. The most common form of encryption is the process of accessing websites that are using https security. You can determine which websites are https by looking at the address bar in your web browser. If the website has http:// in front of the address then it is unencrypted and can be used, however, if it has an https:// prefix then it is an encrypted site and should not be accessed over the ham radio network. **Important! Because no encryption is permitted on the ham network, any credentials submitted via the system (i.e. logging into your email or similar) could potentially be intercepted and stolen. Avoid sending any secure or privileged information over the HAM network. No Commercial Activity – Regulations surrounding the use of Amateur radio for commercial use are clear – it is not permitted. This is, unfortunately, at odds with most of the sites on the Internet which use advertising to generate revenue. It is generally a good idea to avoid websites laden with ads. Definitely do NOT use the network to conduct commercial business transactions. Station Identification – Regulations require that amateur radio stations identify themselves at the start and end of a conversation, as well as every 30 minutes during a QSO. Part of the configuration guide covers how to setup your radio to properly identify itself with your call sign. Ensure you have followed this step correctly. Network Congestion – This isn’t really an amateur radio rule but is an important part of using the system. Because there is only a limited amount of bandwidth available (around 10 MB/s) we ask that users of the system avoid data-intensive activities. Such activities would include streaming video or large file downloads. **Note that this system is designed to primarily be an emergency communications network and is not a substitute for your general Internet service. Using the system as a substitute for general Internet can cause congestion on the network and could get us in trouble with Industry Canada. Chat Server – A simple chat server based on the mattersmost open source application. The server is accessible via a web browser, dedicated PC application or mobile application. The service is available from the Internet and from within the network and is fully self-contained so it will be available regardless of Internet connectivity. Register an account on the server to gain access. DNS Servers – There is currently a single DNS server with two IPs; 44.135.219.21 and 44.135.219.25 which handles DNS for the entire network. Note that this server will only be recursive for queries originating from WITHIN the network, so you cannot use it as your DNS server from home. The DNS server is also authoritative for several subdomains. Web Hosting – Web servers running the Apache software are currently running out of the Cube datacentre. Currently, there is an internal wiki along with a cloud storage website and the potential to add new sites in future exists. Triangle Mountain – This is our main wireless distribution point and primary Internet uplink. Our main Internet feed comes from a 153 km microwave link to Haystack Mountain in Washington state. The speed on this connection ranges from 3 to about 10 Mb/s depending on conditions and the strength of the link. Triangle Mountain also serves as the main distribution point for client access into the network. We have deployed two 120 degree sector antennas which cover a large portion of Greater Victoria, Port Angeles and the Western side of San Juan Island. Check out the coverage map to find out which areas have coverage. Client node at Red Cross – Red Cross House is the home to WARA’s emergency radio room and it is the first client node on the network. Red Cross currently serves as a working proof of concept for how the network could be integrated into an EOC. The system is currently used to facilitate remote access to the PC in the radio room and provide Internet access during club meetings. Hardware consists of a Mikrotik Metal 5SHPn radio and an L-Com HG5827EG 27dBi grid antenna. The site currently receives a signal of around -75dBm giving speeds of up to 10 Mbps. Current coverage is limited to the single distribution site at Triangle Mountain. While the Triangle site overlooks a large portion of Greater Victoria, any obstruction (trees, buildings, vehicles) will prevent you from getting signal. WARA is actively working on establishing additional distribution sites to increase coverage to the downtown/Oak Bay areas. If you would like to connect your EOC or club to the network then check out these instructions: How-to Guide (note that these instructions assume you are using the recommended Mikrotik 5SHPn radio, other radios may work but are not tested or officially supported). Getting connected to the network is a fairly straightforward process but does require some background knowledge of computer networks. If you run into any issues feel free to Contact us or stop by one of our club meetings and someone would be happy to help.